Last year: I ranked Schoenle #48 and said he would be a backup slot receiver (LINK). He made 4 catches for 41 yards and 7 tackles. 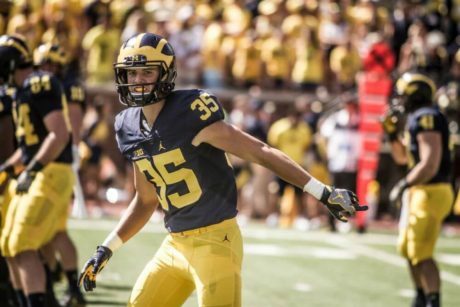 Schoenle was that rare walk-on who played as a true freshman back in 2016. Last year he stepped up his playing time, making 4 catches, including a couple spots that weren’t garbage time (Purdue, South Carolina). He was usually a sign that a running play was coming, and if you guess a toss crack sweep was coming when he was in the game, you’d probably be right 72% of the time. Nothing against Schoenle, but somebody else could make those 4 catches and block on some toss sweeps. I’m bumping him down a few spots, even though I don’t expect his role to change a ton. 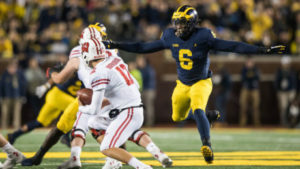 If Michigan does become a bit more pass-happy with a (hopefully) improved offensive line and a new quarterback, then maybe the offense will put somebody else in who can be a little more explosive. There’s also been some buzz about fellow walk-on Jake McCurry. If McCurry takes snaps from anyone, I would imagine it would be Schoenle. After all, how many snaps for walk-ons are there when you have a bunch of highly touted receivers available like Tarik Black, Donovan Peoples-Jones, Nico Collins, and others? Schoenle is a good guy to have on the team, but probably not a necessary component for team success. How common is it to have certain personnel signal the type of play that’s coming? And how much value is that knowledge to opposing defenses? …BUT sometimes coaches see things on the sideline/in the box that the players don’t realize. A football coaching maxim is: “It’s not about what you know – it’s about what your kids know.” If the right people on the opposing team don’t recognize who #35 is or forget about the scouting report, then that might get you in trouble. Furthermore, good teams still execute even when the opponent knows what’s coming. I think Michigan does a good job of using formations and motions to keep opposing defenses off balance. They might send Schoenle out there to put him in twins, but then they’ll shift a tight end and/or a fullback, all the sudden they’re in trips, and then they’ll run the toss. While the defense is trying to figure out the shift and paying attention to the motion, Schoenle is coming down to crack your OLB.